Tiny Houses: A Beginner’s Guide…. Thinking of downsizing? Freeman’s guide will provide food for thought to anyone who is contemplating jumping on the bandwagon of now popular tiny house living. What is considered a tiny house? The author is talking about 100 to 250 square feet of living space. Students, seniors and business owners might be some types of people considering the more economic option. Freeman covers how to plan for building, the construction and blueprints, floor plans and materials that might be used for the exterior. He outlines the possibilities for operating systems and compact appliances for the interior. Freeman presents a few ideas for the most efficient use of space in kitchens and baths as well interior decorating ideas for home owners. 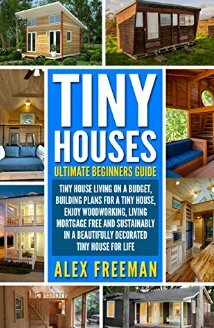 Whether you are just curious or seriously considering building or making the move to a tiny house community, this book will give you the basics that you need to know. Recommended for young adult and adult readers. I find tiny houses so fun to read about, but I don’t know that I could do it. 🙂 Thanks so much for sharing this at Booknificent Thursday on Mommynificent.com this week. I think they can be great for couples, but I don’t think I could do it with frisky little ones in the house.